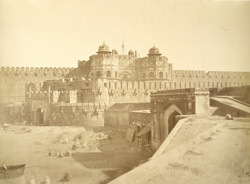 Part of a portfolio of photographs taken in 1858 by Major Robert Christopher Tytler and his wife, Harriet, in the aftermath of the Uprising of 1857. Built principally as a military establishment by Akbar between 1565 and 1573, on the site of an earlier walled complex, the fort is considered the predecessor of the Delhi Red Fort. It is situated on the west bank of the river Yamuna with 2.5 km long enclosure walls with curved bastions at intervals. Emperor Shah Jahan (1592-1666) was responsible for the Mughal buildings within the fort for which the city is renowned throughout the world. The fort walls are 20 feet high and Aurangzeb added the ramparts around the fort walls.